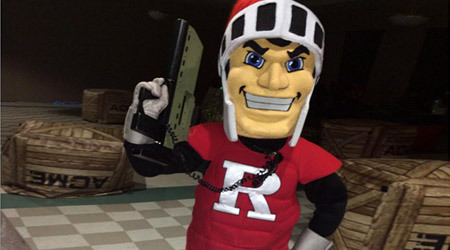 School Events by Outdoor Laser Tag, USA - Leading provider of Mobile Laser Tag for Birthday Parties, Camps and Corporate Events! Outdoor Laser Tag is a great activity for school based events. Our program builds character while teaching students about teamwork, planning and sportsmanship while they are playing and exercising. Every player feels like a winner and is part of a team. 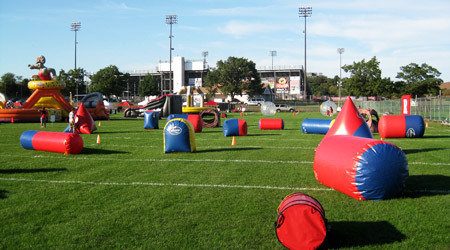 Outdoor Laser Tag, USA will come to your school and set-up a mission field or fields starting in size from 1/2 a basketball court up to an entire football field to allow up to 150 participants to play several games each hour (indoors or outside). You can also book a school field trip and come to our state-of-the-art Outdoor Laser Tag Mission Field at our camp at Black Bear Lake in Clarksburg, NJ. We understand the challenges of in-reach and out-reach events - never knowing how many people will attend presents many challenges. We understand and can be very flexible to accommodate your group. PAY-PER-PLAY: There are no out-of-pocket costs for you. 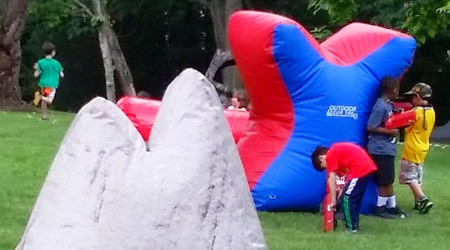 Simply provide Outdoor Laser Tag with adequate space (at least the size of half a basketball/tennis court) preferably on grass, but any surface works, and promote our attendance and location at your event. We bring all the Laser Tag equipment (choice of lasers from BattleField Sports, mission field with inflatable obstacles of all sizes, camouflage pop-up tents, banners and a music system) plus our experienced staff to manage everything. We provide you with supporting marketing materials to complement your event advertising. 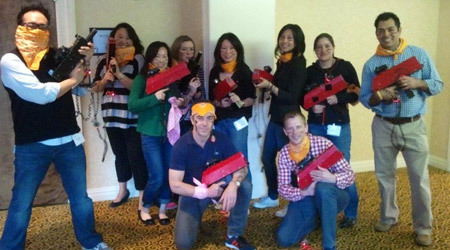 HIRE: Event organizers can hire Outdoor Laser Tag for your event allowing players to play for free. 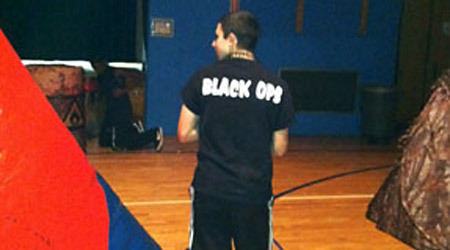 We bring all the Laser Tag equipment plus our experienced staff to manage the entire event. We will provide you with supporting marketing materials to complement your event advertising.